I've added a few extras to this simple and tasty dessert drink from India. It tastes sweet and also provides protein, calcium, Vitamin C, probiotics and more. 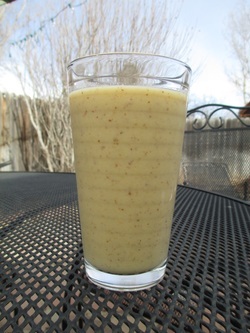 Blend everything in a blender adjusting for sweetness and flavor if needed and serve immediately. Great on a hot day or just a refreshing dessert anytime of the year! Organic, sun-brewed tea is a simple, healthful and delicious chilled treat. I like using mint from my garden and later adding citrus and cucumber but many herbs and fruits can be used. See a few recipe ideas at the end of this article. Be creative and enjoy! First, measure out the herb into the jar. A rough guide to quantity is 1/4 to 1/2 cup of dried plant material to 4 or 5 cups of water, or 1 to 1-1/2 cups to the gallon, but these proportions can be adjusted to suit your own taste and the nature of the ingredients. Roots and seeds tend to make stronger infusions than do leaves and flowers, and are generally used in smaller amounts. If you cut your herbs fresh, you'll need about twice as much as you would if the makings were dried. Pour the appropriate amount of water over the herb in the jar, screw on the lid, give the container a few shakes, and set it where it will receive full sunlight all day long. A rooftop, open field, driveway or similar shade-free area is ideal, but if none is available, keep an eye on the "teapot" and move it on out into the sun as any shadow approaches. Give the mixture a shake whenever you think of it. Your solar tea can then be refrigerated, or, if you'd like a little carbonation, leave the brew tightly capped at room temperature for a while — two hours at the most — and then chill it. The result is a bubbly, slightly intoxicating beverage. This fermentation may not occur in all teas, but is worth trying for. Although I've never attempted to make herb mead, wine or beer by the above method, I'm sure the process would work. Warning: If you try such an experiment, be careful to use all the precautions that go with the preparation of any fermented drink. A capped thermos of ours burst its inner container one summer when we accidentally left it out on the kitchen counter overnight with only about a tablespoon of honeyed solar tea inside. Set the tea to brew in the sun for 1 to 3 days. Strain it and add 1/4 to 1/3 cup honey. Proceed as above (brew the mixture for one day only). Sweeten the tea with honey and add fresh lemon juice. The resulting beverage is demulcent and helpful in soothing sore throats and easing coughs. It's best drunk at room temperature for medicinal purposes.